The judge issued a five-page ruling, rejecting all defense motions in the case but saying she would release a fuller explanation at a later time. This story was reported by Nicole Fuller, Andrew Smith and Robert E. Kessler. Fuller wrote the story. 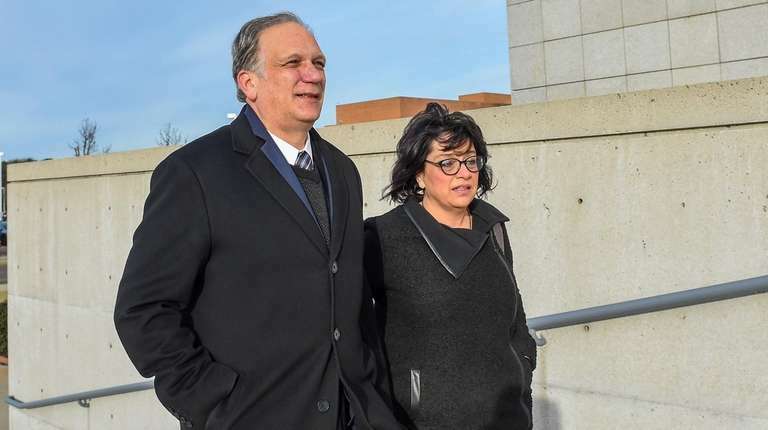 A federal judge seated a jury Thursday for the corruption retrial of former Nassau County Executive Edward Mangano and his wife, Linda, shortly before bluntly rejecting the defense motion to dismiss the case over what it called extensive prosecutorial misconduct. The jury was selected from a pool of more than 100 residents of Nassau, Suffolk, Queens, Brooklyn and Staten Island during a process that began with detailed questionnaires and concluded with in-person interviews at the federal courthouse in Central Islip. "We're confident we have a fair jury," Edward Mangano's attorney, Kevin Keating of Garden City, said after the panel was seated. Just hours after the jury was selected, U.S. District Judge Joan M. Azrack tersely denied all other defense motions, including the motion to dismiss, before the case opens Tuesday. She said a more detailed explanation was to follow. The defense had made a slew of accusations, saying prosecutors had concealed “a key witness” who could aid Edward Mangano's defense; withheld “thousands of undisclosed recordings” of the expected main government witness, restaurateur Harendra Singh, including some material the defense alleges shows that prosecutors knowingly allowed Singh to lie on the witness stand; and concealed evidence that another government witness had erred when claiming that Mangano had lobbied for millions on indirect loan guarantees for Singh from the Town of Oyster Bay. Keating had written that the prosecutorial misconduct was "serious and pervasive," saying that a retrial "is nothing short of perverse." It is not unusual for a judge to issue a brief ruling on important motions shortly before the start of a trial so the attorneys can tailor their opening remarks to jurors before the judge has the chance to write a longer explanation. Linda Mangano’s attorney, John Carman, could not be reached immediately for comment. John Marzulli, the spokesman for Eastern District federal prosecutors Catherine Mirabile, Lara Treinis Gatz and Christopher Caffarone, declined to comment. The previous trial of the Manganos, along with former Town of Oyster Bay Supervisor John Venditto, ended in May. Venditto was acquitted of all charges against him, but jurors could not reach verdicts on the Manganos, resulting in a mistrial. The Manganos are being retried on the same charges they faced last year. Earlier in the day, Azrack quizzed more than 90 potential jurors in separate interviews over a day and a half on their professions, hobbies and education as the prosecutors and defense attorneys, along with the Manganos, listened intently. Those prospective jurors were then whittled down to a pool of 42 on Thursday morning, and lawyers from both sides were permitted to strike people from the jury pool over several rounds, finally resulting in 12 jurors, eight women and four men. The six alternates are three men and three women. Of the 12 jurors, four are Nassau residents from the communities of Rockville Centre, Merrick, Westbury and East Meadow; four are from the Suffolk communities of Lindenhurst, Commack, Manorville and West Babylon. Another two jurors live in Astoria and Long Island City in Queens, and two are from Bedford-Stuyvesant and Canarsie in Brooklyn. The jurors hold a range of jobs, including letter carrier, real estate agent and grade school teacher. Some have master's degrees. One is a part-time chaplain. Azrack instructed the newly empaneled jury to refrain from discussing the case with anyone and to not read or watch any stories in the media on the proceedings. The trial is expected to last five to seven weeks. Assistant U.S. Attorney Treinis Gatz told the judge: "We're ready for testimony." Treinis Gatz is trying the case for a second time along with Mirabile and Caffarone, who is new to the prosecution team. Edward Mangano is charged with seven felony counts, including federal program bribery, honest-services wire fraud, extortion and conspiracy to obstruct justice. Linda Mangano is charged with five felony counts, including conspiracy to obstruct justice, obstruction of justice and making false statements to the FBI. Harendra Singh, the key witness in the first federal corruption trial, who has pleaded guilty to bribery, testified that he lavished gifts and vacations on the Manganos in return for favorable official actions. Mangano's defense argued that the gifts were expressions of a decadelong friendship and were not bribes.